This fully automated system is designed for high production precision cleaning, precision rinsing, overflow rinsing, and drying of medical tubing in batch quantities. It rapidly processes tube bundles of various lengths and IDs vertically loaded into circular basket (see below). It is a continuous feed system that simultaneously processes and transfers multiple baskets. 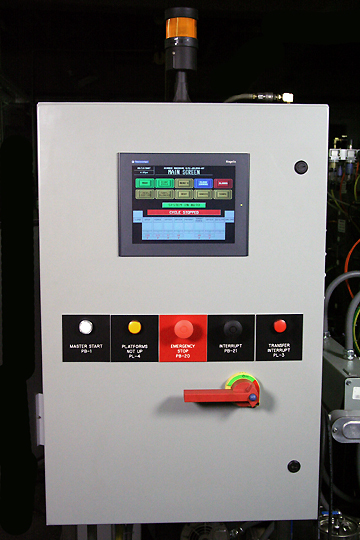 The photo below is of the front of the machine showing stainless steel automation guard and RamNet operators control pedestal (to the left). The heart of the system is the adroit use of process elevators within each chamber. The elevators are used to transport baskets into and out of each chamber. However, the most important function of each elevator is to position and gently move the tubes up an down during the process. 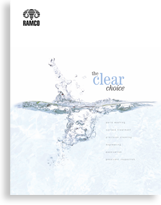 It is this function that allows RAMCO systems to achieve superior results in washing, rinsing and drying. We call it Dynamic Flow Combination. The effects of Dynamic Flow Combination are better coverage of component surfaces, more consistent results, and accelerated processing times. Baskets are positioned between two sensors on a loading conveyor section. The operator simply presses a start button on the conveniently located control panel and the system takes over from there. It automatically indexes, precision washes, precision rinses and completely dries each basket of tubes. The transfer system uses multiple arms to allow for simultaneous indexing of multiple baskets. The consistency delivered by the automation enhances part quality and reduces failures down the assembly/test line. The steps are PLC controlled with dual phases within the precision washing and rinsing stages sequencing powerful ultrasonics with turbo/agitation. The unique RAMCO ultrasonic system cascades powerful sweep frequency (between 38 to 42 kHz) ultrasonics with our standard turbo/filter/agitation washing. 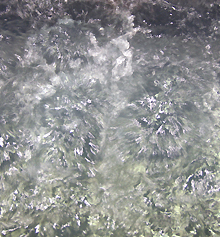 Using mechanical agitation washing to remove gross contamination and ultrasonic cleaning to remove finer and/or more resistive deposits is a very effective processing routine. 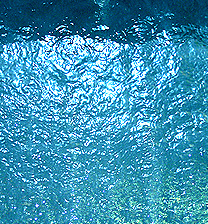 Agitation washing is enhanced when used in conjunction with a TurboFilter System. The Turbo/agitation phase is produced using a high volume all stainless steel pump, closed looped manifolds, and multiple injectors to direct an even flow of turbulent solution through the tubes. The solution is filtered and the flow is adjustable. Turbo/agitation is uses to removes gross contaminants and oil. 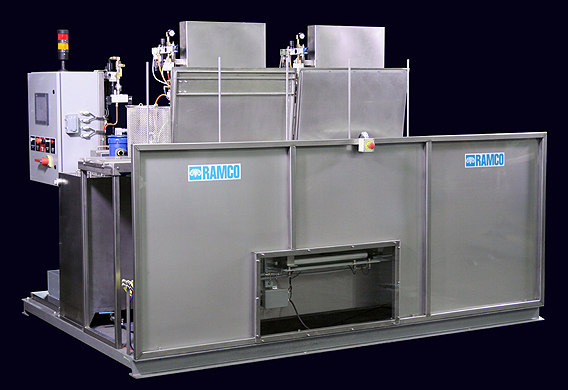 RAMCO turbo systems are proven to accelerate processing time in washing and/or rinsing. The ultrasonic cleaning phase removes the finer and/or more resistive contaminants from the inside of the tubes. MultipleRollover is incorporated to repeat the dual phase sonic/turbo-agitation process for a preset number of “rollovers”. The RAMCO ultrasonic system provides superior ultrasonic washing action over conventional (static) systems by dynamically moving the work through the processing zone. The result of this routine is faster and very effective processing. The ultrasonic stage can also be set to provide continuous vertical oscillation of the work during the sonic cycle. A selector switch is provided for static ultrasonic or oscillating ultrasonic modes. Following precision washing the parts are automatically transferred to the precision rinse stage. The rinse process also includes alternating cycles of agitation with turbulation and powerful ultrasonics. Following precision rinsing the parts are automatically transferred to the final overflowing DI rinse stage. Following rinsing the parts are transferred to a very effective the hot air knife dryer. The machine is built with RamNet microprocessing system. This pattern is repeated. Following rinsing the parts are transferred to the hot air knife dryer An Allen-Bradley MicroLogix microprocessor is used to control each stage. The microprocessor controls the timing, sequencing, all solenoids relating to covers, elevators, pumps, ultrasonic generators and heat. A large color touch screen is located in the Operators Control Station. Each step of the process is PLC controlled. Key validation items are set and accurately monitored. 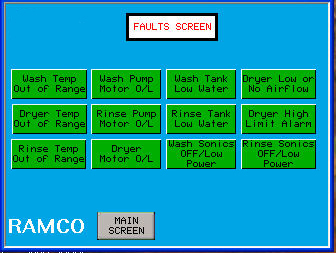 Any fault in the system is immediately reported within the PLC program (see fault screen below) with an external visual stack-light alarm (see top system picture). The process will not continue to run when any fault is detected. Temperature high and low limits, sonic power limits, and all points of the machines function are monitored.